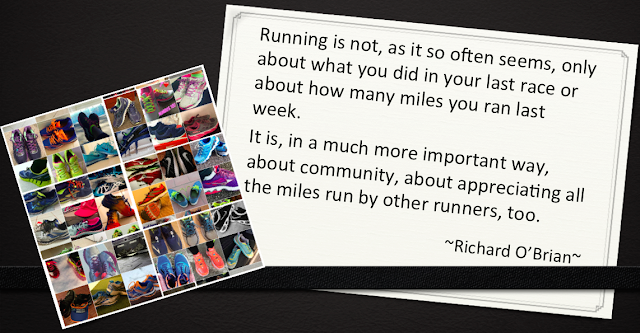 Running groups are like a family. Typically close knit, with a variety of unique personalities. Some members are closer than others (whether that's because of pace or similarities in training that facilitate different bonds developing, or just like-mindedness). Some members see/run with each other more often. And some members show up on occasion (for that "seasonal" group run) and then aren't seen again until next season. At times, just like with family, the running group dynamics become... dysfunctional tense. And ideally that period of tension is short lived because at the end of the day we're a "running family" right? I could go on, but the point is we should not make people who want to run feel like they don't belong, or shouldn't run with our running group because their plans/goals/abilities differ from our own. As members of a broader running community we should encourage and embrace everyone who wants to run and try to facilitate each of us reaching our running goals (as best as we possibly can). I'm probably overly sensitive to the need to make everyone feel welcome because there have been times when I've felt like I wasn't good enough, or fast enough, or had enough endurance to keep up/fit in. And I will acknowledge the fact that I completely control whether or not I will allow a passing comment or an exchanged glance affect how I feel or whether or not I run. But, at the same time, I deal with enough insecurities (actually I have a lot of insecurities) and running is a "safe place" for me. So when I'm out on a group run I don't want to feel like those insecurities are surfacing. And when some of my insecurities are related to running, that's definitely the last thing I want to feel. Unlike bigger groups, small running groups have to be even more careful to avoid the pitfalls of isolating others because... karma. I'm kidding, because it's just not the right thing to do. So if everyone has different mileage goals, then plan runs that have loops or an "out & back" option. If everyone has a different pace, an out & back option is especially accommodating. Another option is to schedule different start times for different mileage/pace goals. Regardless of the option the group chooses, it's important to ensure that the plan takes everyone into consideration (or at the very least, if you can't accommodate all, then accommodate most of the group). 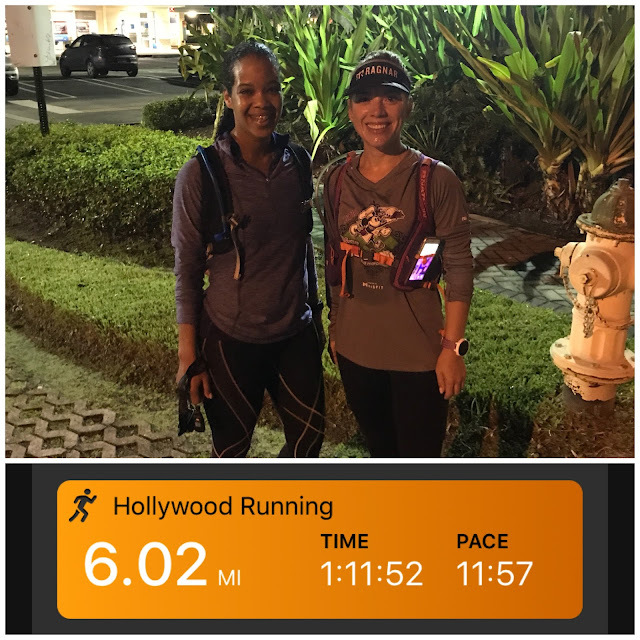 Mimi (in the picture with me) was doing her final really long run in preparation for Dopey, and graciously broke her run into 6-6-6-4 mile loops so that I could do 6 (first loop), another runner could do 12 (middle loops), and another runner could do 10 (last two loops). Of course, it's mutually beneficial because Mimi gets a change of company and pace with each of us that did different loops with her, and the rest of us get our desired mileage completed. This is how running groups should work. Ideally, we should find a way to work with each other in supporting each other's goals. It won't always fall into place nicely. Sometimes a runner may need to break off/turn back early, or continue to do more mileage after the group run is over. But the spirit of encouragement should be at the forefront... and when it is running groups shine. If yes, how does your group accommodate runners of different levels? If no, why do you prefer to run solo? I love running in at least a duo for longer runs. It makes the miles go by so quick. Shorter runs are fine alone as i just blast my music and go. I love the accountability of a group. The motivation that a group gives is the best. I have gotten faster due to my group runs bc i would have never pushed myself as far and fast as i would have without them. My goal this year is to run a half marathon length every month. It is easy to while in groups to feel pushed out. We have a fb page for our group. We post when we will be going out and the mileage. We try and fit people into pace groups they are comfortable in. I know some of my running partners accommodate for me :). I am greatful for them running with me but pushing me at the same time. I agree! I found that recently I push myself on group runs more than I do on solo runs (most of the time). There are so many benefits to the group as long as we are there for each other, supporting each other. It's unfortunate when not everyone in the group sees the importance of that. Anyway, everything has it's season so the group will either get stronger or fall apart. I'm hoping it will get stronger (fingers crossed) so we'll see. BTW I can't wait to run with you again! Ragnar 2018!